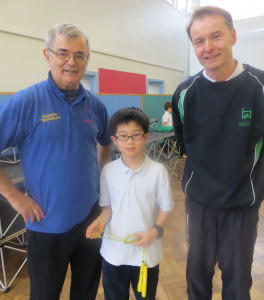 Ken Tezuka from Hall School, Wimbledon, last week skipped 100 Double Unders, scoring more than double the previous high score of 47. Last year’s overall high score in the Double Unders category was 100. Ken has already equalled that score, and still has plenty of time to improve. Double Unders have long been one of the most difficult skips in the National Skipping Challenge and any scores at all are very difficult to achieve. If you want to learn to do Double Unders, or any of our other National Skipping Challenge skips then contact Skipping Workshops to organise a visit to your school.